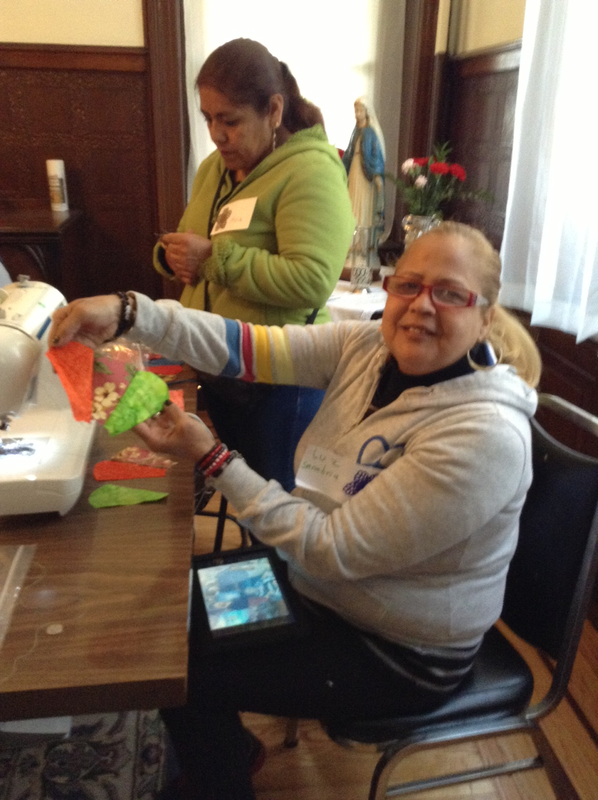 Thanks to our ministry partners, the Dominican Sisters of Hope, who included an article about the Passaic Neighborhood Center for Women in their Fall 2013 newsletter, Speaking of Hope. Click here to read the article. The October 24 issue of The Beacon contains an article about how the strong support of the Partners in Faith campaign has allowed the Center to open and thrive in its first month of operation. Please click here to read the article, written by Cecile SanAugustin. We are most grateful to those who have contributed to Partners in Faith and to all of our partners -- the religious communities of the Paterson Diocese, the various diocesan offices and individuals who have given invaluable support, the pastors of the Passaic Deanery, our Passaic neighbors, the staff of St. Mary's Hospital, Passaic and the staff of so many organizations who have encouraged our efforts. The German theologian Meister Eckhart (1260-1327) has said, "If the only prayer you ever say is 'Thank you,' that is sufficient." Please allow our prayer of gratitude -- the best prayer we can offer to and for our benefactors and friends -- to suffice. We are grateful to Sister Pat Reynolds, SC for teaching our quilting class, which began yesterday, October 22. Click here to view some photos from the class. 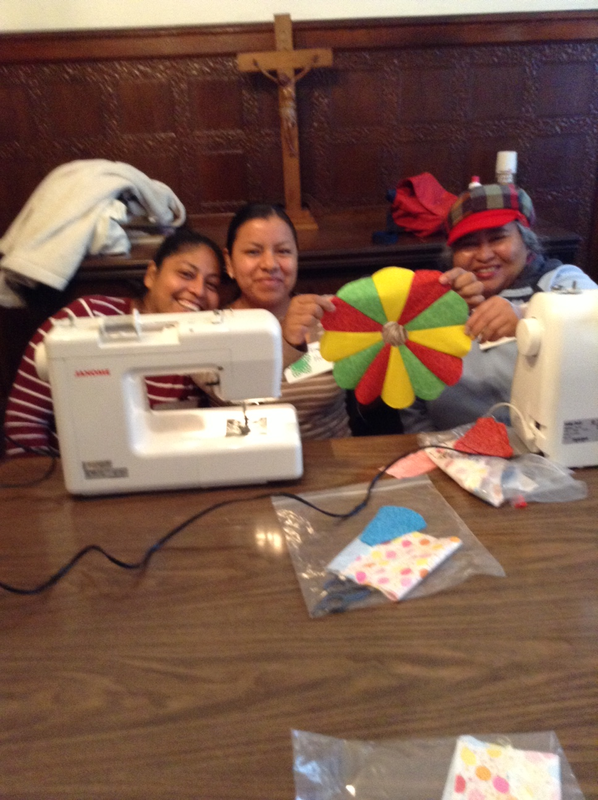 Because Sister Pat was kind enough to share sewing machines and materials with us, our women were able to have a quilting class. In the future, we will be asking for contributions toward purchasing our own sewing machines and materials. We are purchasing the machines because it is important that every woman is working from the same machine and that we know the machines are in excellent condition. (Kind of like teaching a class using the same textbook for each student...) Thank you for any contributions you can make toward this goal. When you view the photos, you might notice that there are lists of words on the wall. These are the words used by the women in the English classes. As you can see from the multiple lists, the women have learned an abundance of English in just a few weeks! During the month of September, volunteers at the Passaic Neighborhood Center for Women gave 54 hours of service. (Considering we only opened the doors on September 24, this is wonderful!) We are so grateful to these volunteers -- Sister Ursula Carr, SC, Sister Mary Culhane, SC, Nancy DiRocco, and Sister Catherine Drury. Do you know anyone who would like to volunteer at the Center? How about college students who have a community service requirement? Retired women or men looking to volunteer a few hours each week? Sisters in your religious community? Associates of your religious community? Please have them call us at (973) 470-0844. The expansion of our programs depends on increasing our staff of volunteers. We are most grateful for any volunteers you refer to us. Thank you to our diocesan newspaper, The Beacon, for covering our opening on September 24. Click here to read the entire issue. Be sure not to miss our article on pages 1 and 2. The winners of the opening day raffle were announced on Monday. Congratulations to Margarita, Patricia L., Patricia M., Lucia and Claribel. Here we see Margarita and Patricia M. claiming their winning baskets. On Tuesday, October 1, Sister Ursula Carr, SC and Sister Mary Culhane, SC helped our women begin their journey toward strengthening their English skills. Two women attended a morning session and five women attended an afternoon session of English class. Sister Mary Culhane, SC teaches the English class how to access ESL materials online. Sister Ursula Carr, SC and Sister Mary Culhane, SC teach an afternoon English class.